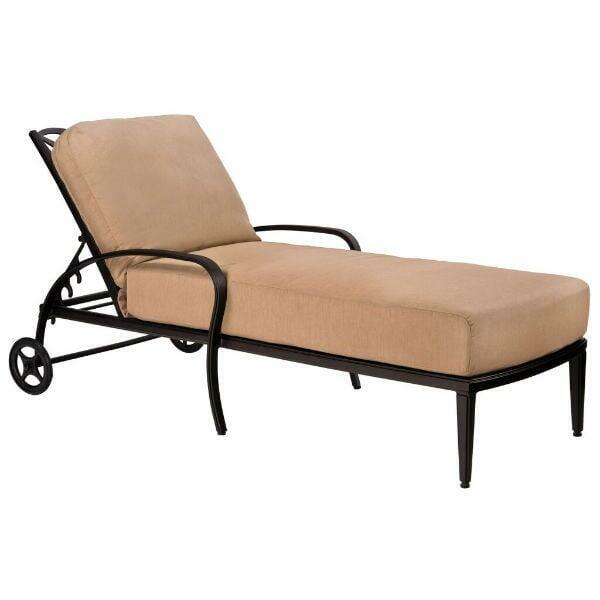 Chaise lounges are ideal for sun bathing while poolside, laying under the stars, or reclining by the grill. The Apollo Chaise Lounge belongs to a larger collection of Apollo furniture by Woodard. Each piece from the Apollo collection features a similar cast aluminum frame design, and the seats feature plush, fluffy cushions for easy living. The Apollo Chaise integrates seamlessly into a larger collection of other Apollo furniture, or it may stand alone as a functional piece. The Apollo Chaise both reclines and sits up, so users may catnap or read a book while enjoying support from the cushion and heavy frame. Cast aluminum furniture is heavy by nature, so it is ideal for use in areas where inclement weather may strike. It will not be blown away by heavy winds and storms. Woodard furniture is known for resilience over years of use.